Along with eight other girlfriends, every week I split three Community Supported Agriculture (CSA) bins from a local organic farm. Each week, my veggie bin is overflowing with farm-fresh lettuce, carrots, kale, herbs, potatoes, melons, tomatoes and more. All of this bounty is wonderful. But sometimes we’re not able to eat everything before it starts to spoil. Then I came across Rubbermaid’s Produce Saver set. 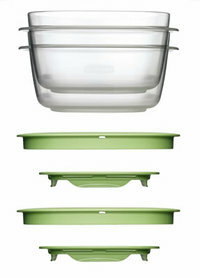 This four-pack of BPA-free storage containers (2 cup x 2 , 5 cup and 14 cup) includes a traditional container, a Crisp Tray that sits in the bottom of the container and keeps the produce off any residual moisture and a unique Fresh Vent lid that allows the contents to breathe and air to circulate. • Use a Produce Saver container that will best fit the item that you are storing. • Don’t wash produce before storing it in the Produce Saver. • Produce Saver containers are best for un-packaged produce. If you buy produce that comes in a pre-sealed bag (like bagged lettuce), keep the lettuce in the pre-sealed bag until you are ready to use it. You can read all of the tips here. In addition to helping my produce last longer and being BPA-free, I also love that the Produce Saver is microwave, freezer and dishwasher-safe, has Rubbermaid’s Easy Find Lids system (lids and trays snap together as well as to the base for easy storage) and is compatible with all of Rubbermaid’s other storage containers including Easy Find Lids, Lock-Its and Premier (any lid in the Rubbermaid food storage series will fit any base and snap onto the bottom). Ready to extend the life of your produce? 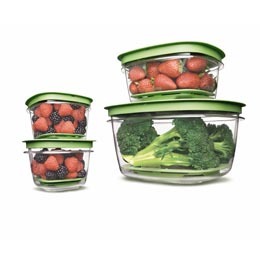 Visit Rubbermaid’s website – www.rubbermaid.com – to learn more and click here to get $1 off the purchase of your own Produce Saver or any of Rubbermaid’s other food storage containers. Wow, awesome weblog layout! How long have you ever been blogging for? you make blogging glance easy. The full look of your website is great, let alone the content material!